MONTICELLO, Ark. 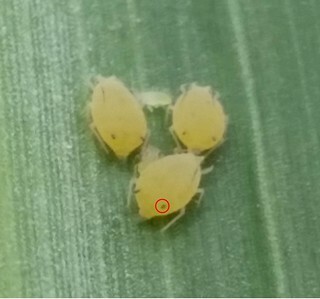 – Grain sorghum growers in east Arkansas are discovering a new visitor: the sugarcane aphid has been showing up since June on the plant’s leaves in Ashley, Chicot, Desha and Phillips counties and it’s considered likely to spread to nearby areas. Its damage symptoms include sticky honeydew and yellow to reddish brown leaf discoloration. 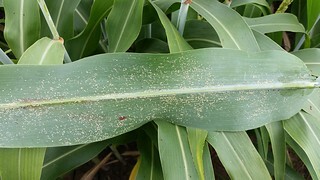 The pest is also known as the white sugarcane aphid to distinguish it from the yellow sugarcane aphid, a mild to moderate sorghum pest that seldom requires treatment. It’s the large amounts of sticky honeydew that can cause the worst problems for the plants. The aphid began appearing on grain sorghum last year in Texas, Oklahoma, Louisiana and Mississippi. Seiter said that previously affected areas reported yield losses from harvest difficulties can reach up to 50 percent in extreme cases. Large amounts of honeydew can also cause additional costs to repair and clean equipment. Seiter said chemical control options are limited. The federal Environmental Protection Agency recently granted an emergency exemption allowing the use of the insecticide Transform WG in Arkansas against sugarcane aphids. The EPA policy – known as a Section 18 label exemption – permits additional specified uses beyond what is printed on the product label during a short-term pest management crisis in a particular area. 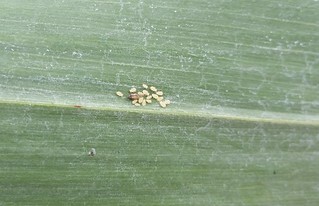 Under the Arkansas exemption, producers may apply 0.75 to 1.5 ounces of the product per acre to control sugarcane aphids with a maximum of two applications during the season. Seiter said it has provided good control during trials in Texas and Louisiana. Two other insecticides -- dimethoate and chlorpyrifos (Lorsban) – have provided mixed results at best against sugarcane aphid and have limited usefulness in preventing honeydew buildup. Pyrethroid pesticides are considered ineffective against sugarcane aphids and may actually cause additional aphid outbreaks by eliminating their natural enemies. “Unfortunately, there is no research-based action threshold for sugarcane aphid in sorghum at this time” Seiter said. He advised producers to monitor fields carefully and look for the pests on the underside of leaves as well as other parts of the plant. 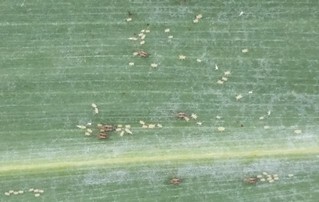 To learn more about pests, visit http://arkansascrops.com, www.uaex.edu, or contact your county extension office.